Derek McLeish appointed President of SonoSim International. 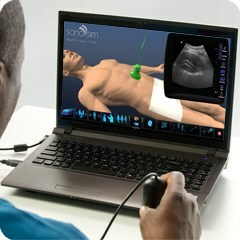 For more information, visit http://sonosim.com/international. SonoSim develops and markets state-of-the-art simulation training products for physicians, nurses, students and care providers across the globe who need to continually expand and improve their ultrasound skills. With its staff of leading ultrasound educators, computer-based instructional designers, content editors, computer engineers and scientists, and software developers, SonoSim® has created the easiest, most effective and convenient way to learn ultrasound: the SonoSim® Ultrasound Training Solution. For more information, visit: http://www.sonosim.com. © 2013. SonoSim, Inc. All rights reserved. SonoSim and The SonoSim Ultrasound Training Solution are trademarks of SonoSim, Inc. All other trademarks are the property of their respective owner(s).